It was a long haul, but I finally finished Eleanor Catton’s tome, “The Luminaries,” and I have two very strong feelings about it: 1) I freaking loved it, 2) I’m angry with it. “It is 1866, and Walter Moody has come to make his fortune upon the New Zealand goldfields. On arrival, he stumbles across a tense gathering of twelve local men, who have met in secret to discuss a series of unsolved crimes. A wealthy man has vanished, a whore has tried to end her life, and an enormous fortune has been discovered in the home of a luckless drunk. Moody is soon drawn into the mystery: a network of fates and fortunes that is as complex and exquisitely patterned as the night sky. Now, here’s what I have to say about it: In a nutshell, the reason for my two opinions comes from the fact that there are two colossal mysteries that make up the meat of this book. One mystery, I’ll call it the plot-line mystery, is extremely interesting, and I wanted to know what was happening so badly that I spent multiple nights staying up past my bedtime, failing to find a suitable place to put the damn thing down and sleep. The telling of this mystery was masterful, and in the end it was (almost) satisfyingly resolved. The second mystery, which I’ve named the theme-mystery, has to do with an EXTREMELY (like bricks in your backpack) heavy presence of astrology via the allocation of zodiac and planet symbols for every character, the presence of little zodiac star wheels at the beginning of each chapter, the naming of chapter heads as things like “Sun in Virgo,” “Mercury in Pisces,” etc, and a few bitty mentions of otherworldly goings on, upon which I spent the entirety of the book reading very deeply into, browsing through astrology.com, and creating complicated character charts of my own, only to reach the end of the book and have no clue as to what all this astrology meant or why it was used at all, other than for superficial purposes such as organization, and to frustrate the hell out of me. Let me stop here for a moment, and give my recommendation, which is that “The Luminaries” is a great read. I recommend you to read it 100%, but be prepared to reach the end and not have all the answers. It could just be that I wasn’t trying hard enough to make sense of all the astrology, and usually I would consider these types of books, the ones that make the leisure reader work too hard (some working is okay), not worth my time. But because the rest of the novel was so awesome, and because it produced that very important effect of making me unable to sleep, then I would consider it to be a great success. Also, as someone who wishes to write their own book in the future, I can’t even imagine sticking with someone for 800+ pages and making it sound at all good. So with that, and without more details because I don’t want to spoil the book, I’ll stop right here. However, as I don’t know anyone in person who has read this book yet, if you have anything to say about it, or want to discuss anything that happened, please leave a comment. I would love to get a discussion going. 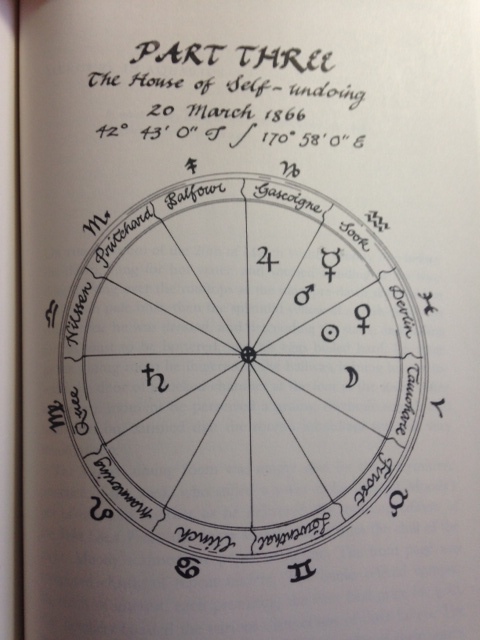 This entry was posted in Book Reviews, Fiction, Recommended and tagged astrology, book review, books, Eleanor Catton, fiction, The Luminaries. Bookmark the permalink.